The IP-9600 is an industrial rated router with 4 serial ports and 2 Ethernet LAN ports. All four serial ports may be configured as asynchronous. One or two of the ports can be synchronous with external clocking on both ports, internal clocking on one port. The IP-9600 may be used for connections needing up to T1 speeds. The four RS-232 serial ports operate at async speeds from 300 bps to 230 Kbps. One sync port is RS-232 up to 1 Mbps, the other, when ordered as RS-530, can be clocked up to 1.544 mbps. Serial ports may be used to link two separate remote sites with leased or dial connections, one port used for an ISP connection, another for dial-in, each used for combined dial-in and dial-on-demand dial-out, or other combinations. The two ethernet LAN connections (one 10BaseT, the other auto-switching at 10 or 100BaseT) may be configured on different LAN segments for DMZ routing, firewalling and port/address filtering, or used as a DSL or cable modem adjunct for network address translation (NAT). 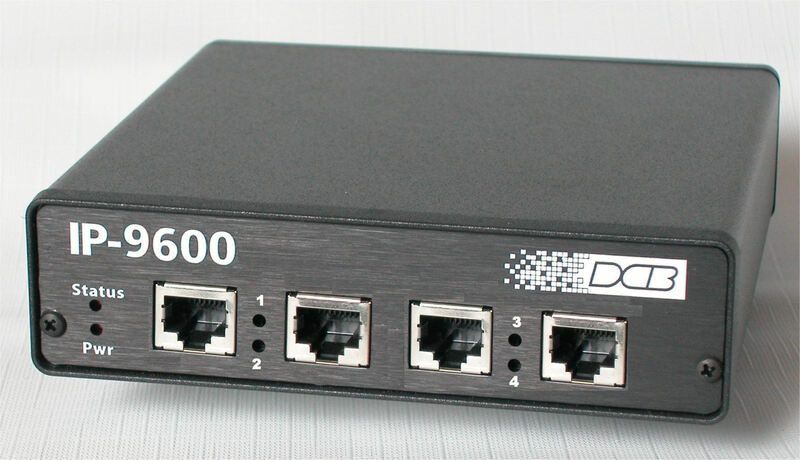 The IP-9600 works well with DSL, cable or dial modems, leased line modems, CDPD or GSM modems, wireless links, satellite modems, T1 DSUs, the DCB DL-56 DSU, or even simple line drivers. Flexibility is the key. Routing may be between any combination of interfaces with full-featured port or address filtering, port forwarding, and NAT. The same port may even be configured for dial-out/dial-on-demand while accepting dial-in calls from portable computer users. It’s easily configured for “stay-online” dial connections. Configuration is quick and easy using a web browser. The router uses 3 different configurations: a stored configuration, a working (running) configuration, and a pending configuration. This method allows temporary configuration changes, testing, and remote configuration changes even via a PPP link on the router. Configurations may be saved on a PC for later use, and the config file is editable on a PC. The IP-9600 is straight-forward, easy to configure and maintain. The IP-9600 has the features you want without the complexity. we prefer that you phone us and discuss your application prior to ordering.